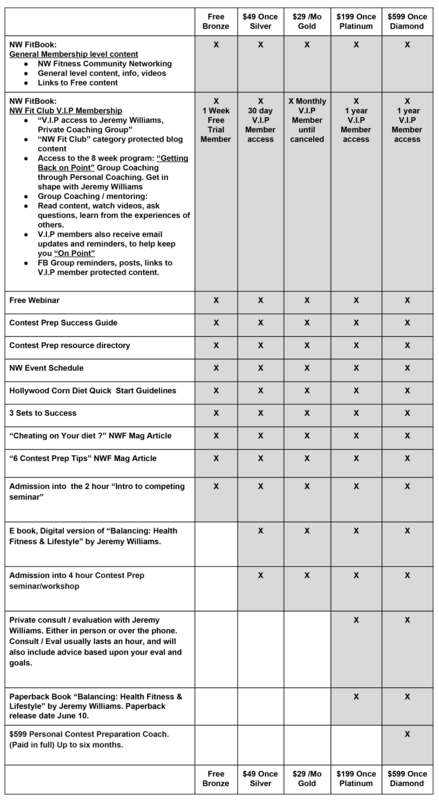 If you are interested in learning more, register for Jeremy Williams next live seminar/workshop, or Join the personal & Group coaching platform NW Fit Club. 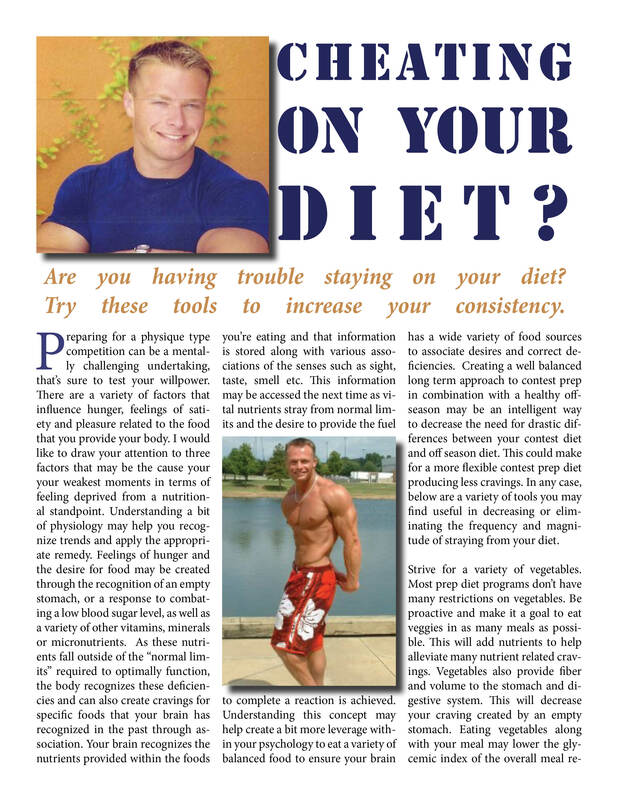 Are you having trouble staying on your diet? Try these tools to increase your consistency. 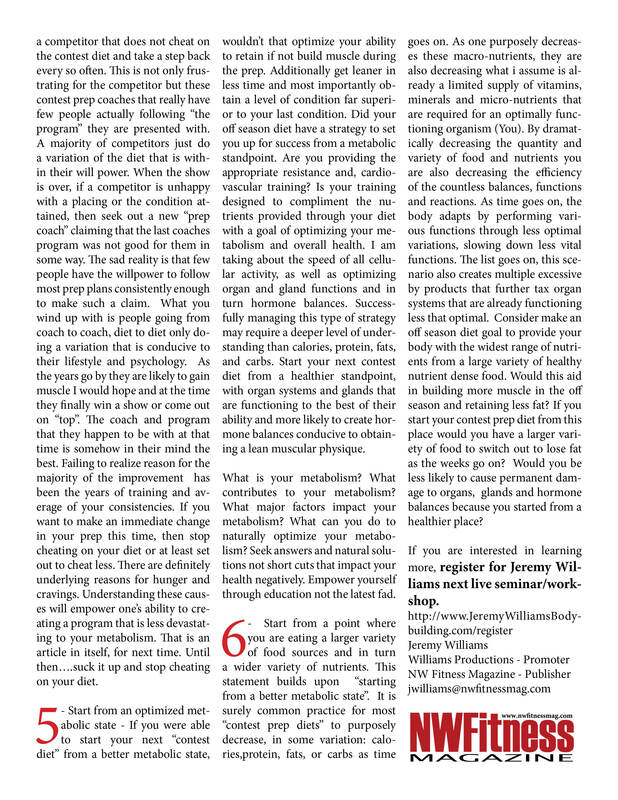 Preparing for a physique type competition can be a mentally challenging undertaking, that’s sure to test your willpower. There are a variety of factors that influence hunger, feelings of satiety and pleasure related to the food that you provide your body. I would like to draw your attention to three factors that may be the cause your your weakest moments in terms of feeling deprived from a nutritional standpoint. Understanding a bit of physiology may help you recognize trends and apply the appropriate remedy. Feelings of hunger and the desire for food may be created through the recognition of an empty stomach, or a response to combating a low blood sugar level, as well as a variety of other vitamins, minerals or micronutrients. As these nutrients fall outside of the “normal limits” required to optimally function, the body recognizes these deficiencies and can also create cravings for specific foods that your brain has recognized in the past through association. Your brain recognizes the nutrients provided within the foods you’re eating and that information is stored along with various associations of the senses such as sight, taste, smell etc. This information may be accessed the next time as vital nutrients stray from normal limits and the desire to provide the fuel to complete a reaction is achieved. Understanding this concept may help create a bit more leverage within your psychology to eat a variety of balanced food to ensure your brain has a wide variety of food sources to associate desires and correct deficiencies. Creating a well balanced long term approach to contest prep in combination with a healthy offseason may be an intelligent way to decrease the need for drastic differences between your contest diet and off season diet. This could make for a more flexible contest prep diet producing less cravings. In any case, below are a variety of tools you may find useful in decreasing or eliminating the frequency and magnitude of straying from your diet. Strive for a variety of vegetables. Most prep diet programs don’t have many restrictions on vegetables. Be proactive and make it a goal to eat veggies in as many meals as possible. This will add nutrients to help alleviate many nutrient related cravings. Vegetables also provide fiber and volume to the stomach and digestive system. This will decrease your craving created by an empty stomach. Eating vegetables along with your meal may lower the glycemic index of the overall meal resulting from a steady blood sugar level producing less cravings. The added nutrients may could contribute to your feeling of well being by assisting in the balance of hormones or neurotransmitters affecting your mood. At times of hunger try filling up on veggies rather than cheating on an obvious bad choice. Add a variety of fresh herbs to your meals.Similar to adding vegetables, this may help decrease craving by providing more nutrients. Many suggest that herbs such as fenugreek, cinnamon, nutmeg, cardamom, and ginger have been shown to decrease sugar cravings. 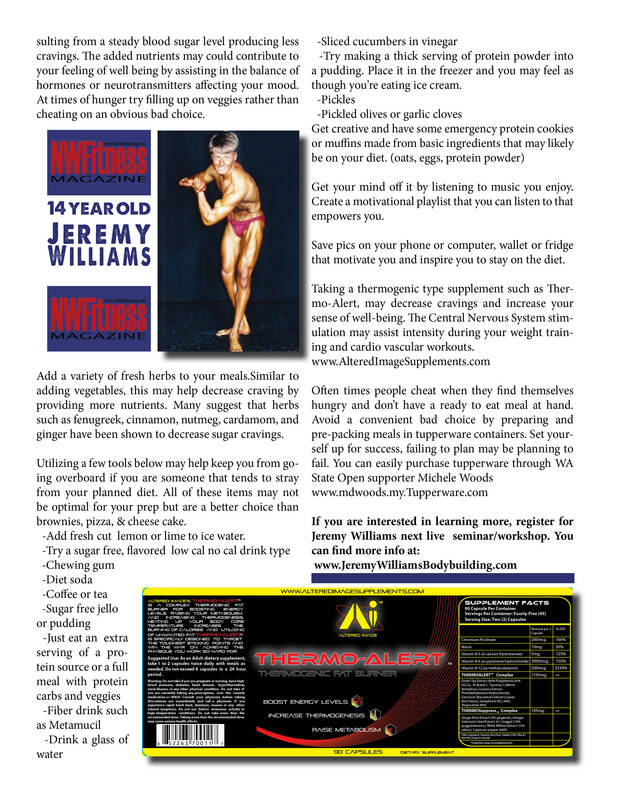 Utilizing a few tools below may help keep you from going overboard if you are someone that tends to stray from your planned diet. All of these items may not be optimal for your prep but are a better choice than brownies, pizza, & cheese cake. Add fresh cut lemon or lime to ice water. Try making a thick serving of protein powder into a pudding. Place it in the freezer and you may feel as though you’re eating ice cream. Get your mind off it by listening to music you enjoy. Create a motivational playlist that you can listen to that empowers you. Save pics on your phone or computer, wallet or fridge that motivate you and inspire you to stay on the diet. Often times people cheat when they find themselves hungry and don’t have a ready to eat meal at hand. Avoid a convenient bad choice by preparing and pre-packing meals in tupperware containers. Set yourself up for success, failing to plan may be planning to fail.